Learn all the secrets to making the perfect New York Cheesecake every time. The texture is smooth and creamy without being too dense, and it has a delicious, slightly tangy flavor that’s totally decadent. New York Cheesecake is a classic for good reason. Nothing can beat a smooth, creamy, ultra rich cheesecake. Which is exactly why every baker (or wannabe baker) needs the perfect New York cheesecake recipe. And that’s exactly what I’m sharing with you today. Creamy, dreamy, and velvety smooth; decadent, not too sweet, and perfectly rich. 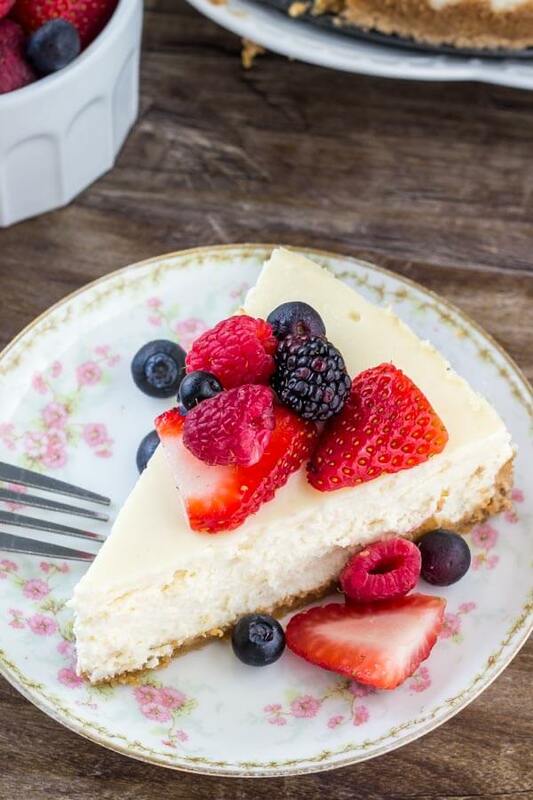 I’m also including ALL of my cheesecake making tips for the perfect cheesecake every time. Be warned, there’s a lot of baking science ahead. To get straight to the recipe you can go down to the bottom of the post. 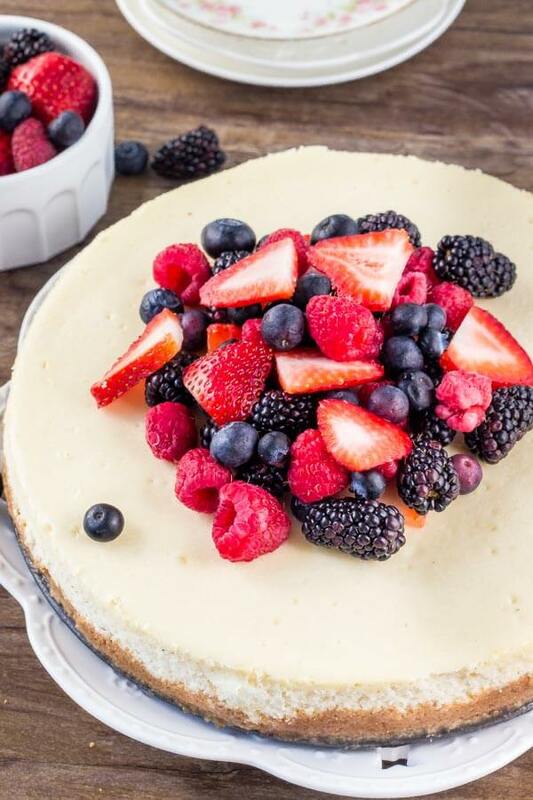 But for the perfect cheesecake with a super smooth texture and zero cracks – be sure to read all the details. Ok – ready for some science/tips?????? First mix together graham cracker crumbs, a little sugar and melted butter. I typically buy the crumbs in a box (you can find this in the baking aisle of your grocery store), or crush graham crackers in your food processor. Then press into the bottom and slightly up the sides of your spring form pan. I like to bake the crust on its own for 8 minutes – this creates a crunchier crust. For the cheesecake layer, each ingredient is super important and has a special job. Three 8 oz packages of full-fat, brick-style cream cheese. Since cream cheese is the main ingredient, it’s important to use the a high quality brand. It needs to be full-fat to get the rich and creamy flavor (no ones trying to lose weight by eating a cheesecake), and you need brick-style for the proper texture. 1 cup sugar. There actually isn’t very much sugar in a New York cheesecake. It needs to be sweet enough to balance the tang of the cream cheese, but because the flavor is so rich already it shouldn’t be overly sweet. 3/4 cup sour cream creates a super velvety texture and adds a delicious tang. 2 teaspoons fresh lemon juice and 2 teaspoons vanilla extract for flavor. 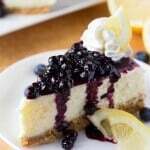 1 tablespoon of cornstarch helps to bind the cheesecake together and prevents cracks. If you don’t have cornstarch, you can substitute it for flour. Don’t worry, you definitely don’t taste it. 4 large eggs. The eggs bind everything together, but it’s important not to whip the eggs too much or else air can get into the batter. 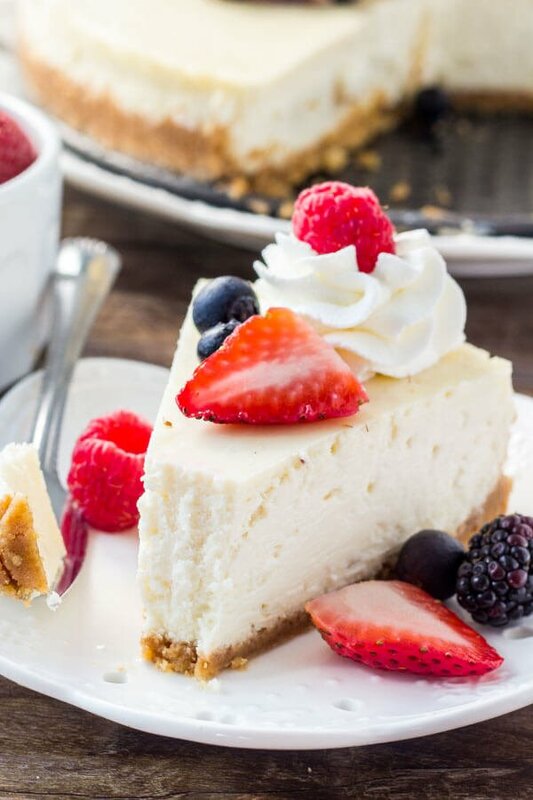 When making cheesecake there’s a few key tips that help to prevent cheesecake cracks and ensure your cheesecake is velvety smooth. First, bring all your ingredients to room temperature first. This ensures that everything mixes together evenly without any lumps. No one wants a bite of pure cream cheese. Then be very careful not to mix the cheesecake too much after you add the eggs into the batter. When you whip the eggs, more air gets in. The excess air rises as the cheesecake bakes, and then the cake deflates as it cools. This causes cheesecake cracks. Always, always, always use the water bath method when baking a cheesecake. The cheesecake pan is placed inside a large roasting pan, and hot water is poured into the roasting pan so that there’s about 1/2 to 1 inch of water in it. Then the whole contraption goes in the oven for the cheesecake to bake. Adds moisture, therefore stopping your cheesecake from drying out. Minimizes drastic changes in temperature. If the temperature changes too quickly, your cheesecake is more likely to fall quickly (remember what we talked about with the air and the eggs?) and therefore crack. 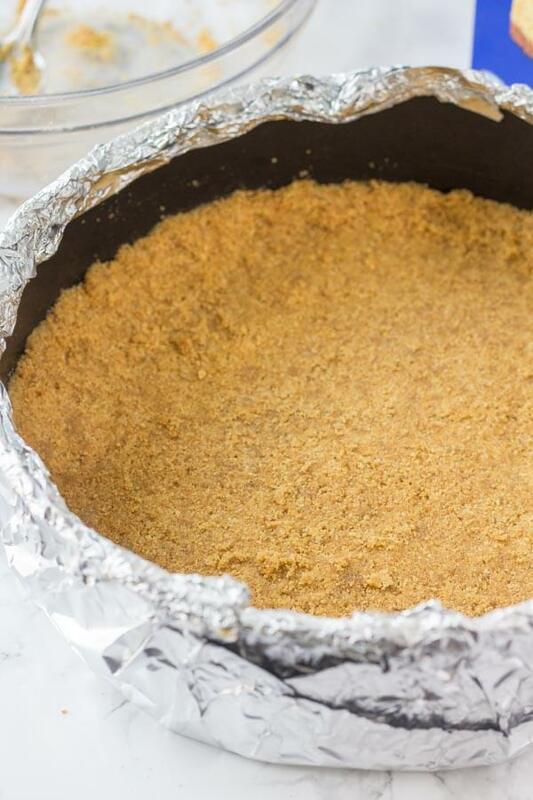 Just make sure to wrap the bottom and outside of your spring form pan with aluminium foil before making the crust. Wrap it at least 3 times so that all the edges are fully covered. This is super important so that water doesn’t seep into the cheesecake while baking. After the cheesecake is done baking, cool it very slowly. First take the entire water bath out of the oven and allow the cheesecake to cool in the roasting pan. Once the water is lukewarm, you can remove the cheesecake from the roasting pan and allow it to continue cooling until it’s room temperature. Then cover the top of the pan, and place it in the fridge to chill for at least 6 hours. I definitely recommend chilling your cheesecake overnight if possible. 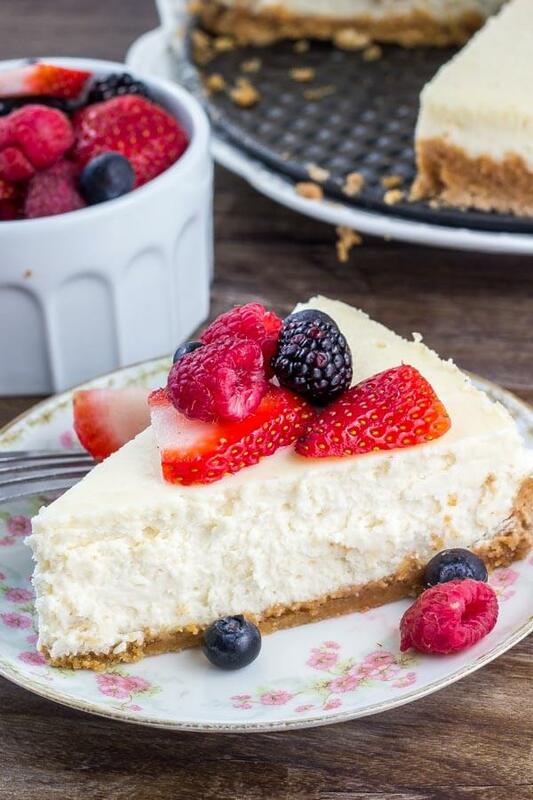 This allows all the flavor to really develop, and it also allows the cheesecake to set. This makes it easier to slice the cheesecake and get it out of the pan. Last but not least, bring the cheesecake out of the fridge about 20-30 minutes before serving. I promise it’ll taste better. New York cheesecake is delicious exactly as is with no toppings. But you can really dress it up or dress it down however you cheese. A few fresh berries or whipped cream can go a long way. Or add a drizzle of caramel, chocolate peanut butter, or blueberry sauce. Smooth, creamy, decadent, delicious New York cheesecake everytime. Learn all the secrets to making the perfect New York Cheesecake everytime. The texture is smooth and creamy without being too dense, and it has a delicious, slightly tangy flavor that's totally decadent. Preheat the oven to 350F degrees. Wrap the bottom and sides of a 9 inch spring form pan with aluminium foil. Wrap it at least 3 times so that no seams are showing. In a medium bowl stir together the graham crumbs, sugar and melted butter. Press into the bottom of the spring form pan, creating a little edge up the sides. Bake in the preheated oven for 8 minutes. In a large bowl beat the cream cheese until soft (at least 2 minutes). Turn off the mixer and scrape down the sides of the bowl as you go. Beat in the sugar. Then mix in the cornstarch (you may need to sift it first), lemon juice and vanilla extract. Mix in the sour cream, continuing to scrape down the sides of the bowl as necessary. With the mixer on low speed, mix in the eggs 1 at a time. Only mix the batter until the eggs look just combined. You can turn off the mixer and gently fold them in with a rubber spatula. Place the spring form pan (wrapped in aluminium) inside a large roasting pan. Pour the cheesecake batter into the pan. Then pour water into the roasting pan so that there's about 1/2-1 inch of water. Place the roasting pan (with cheesecake inside) into the oven. Bake for 40-50 minutes or until the top looks almost set except for in the very middle and there's a little wobble still in the middle of the cake. Remove the roasting pan and cheesecake from the oven. Cool the cheesecake in the roasting pan until the water is lukewarm. Then remove the spring form pan from the roasting pan and peel back the aluminium foil. Cool the cheesecake until the pan is room temperature. Cover the pan and chill the cheesecake in the fridge for at least 6 hours. 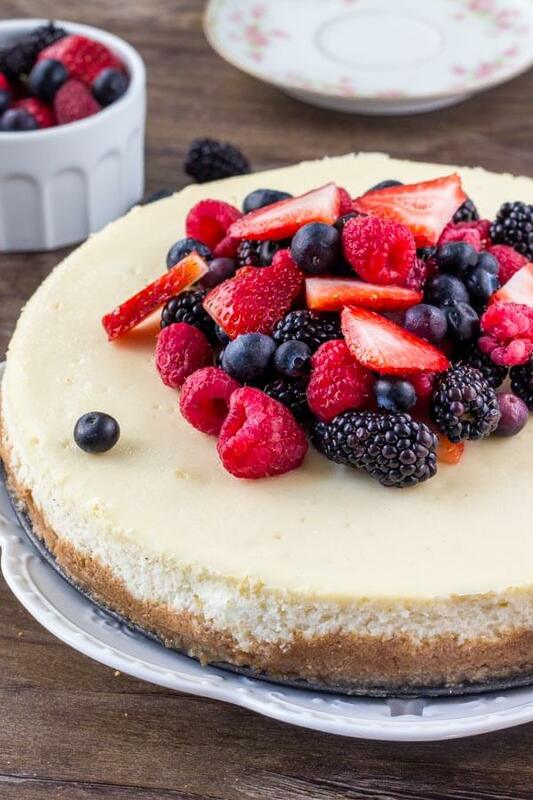 When ready to serve, remove the cheesecake from the fridge about 20 minutes prior. Cut into slices and top with fruit or your favorite toppings. *Ensure the cream cheese, sour cream and eggs are room temperature before getting started. **1 tablespoon of cornstarch can be replaced with 2 tablespoons of flour. ***Store cheesecake in the fridge. 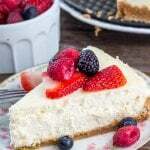 Cheesecake can be frozen and thawed in the fridge over night. Made this for a crowd and it turned out beautifully! Fabulous recipe. I am a sucker for a good New York Style Cheesecake! This looks absolutely wonderful! I am definitely making this weekend. Would it be as delicious without the lemon juice? not a big fan of lemon juice!